Indeed, the world of Ray Bradbury’s preeminent dystopian science-fiction novel—and of HBO’s forthcoming film adaptation, co-written and directed by Ramin Bahrani (99 Homes)—is one in which information is a threat; firemen start fires, rather than putting them out, burning dissent and rebellion out of their society. “A little knowledge is a dangerous thing,” Beatty warns. 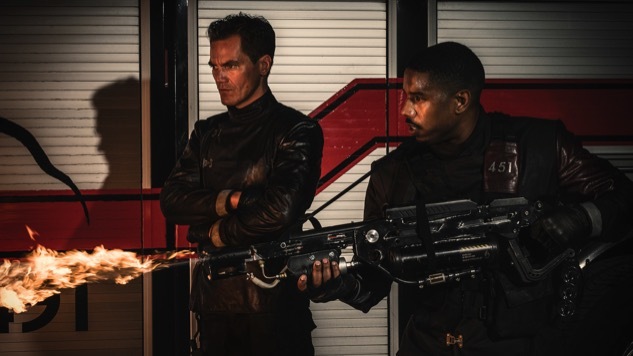 Jordan, arguably one of the hottest actors in Hollywood after stealing the show as the antagonist of Ryan Coogler’s Black Panther, looks to stay hot in Fahrenheit 451: “I want to burn,” he hisses towards the end of the teaser, promising a room full of young students at another point, “By the time you guys grow up, there won’t be one book left.” However, as readers of Bradbury’s 1953 book well know, Montag, much like Jordan’s Black Panther character Killmonger, is much more than simply a two-dimensional villain: Eventually, the fireman turns on his fire-mongering mentor, no longer content to be a party to the indiscriminate incineration of ideas. And speaking of villains, Shannon is perfectly cast as Beatty, the steely fire captain who will stop at nothing to bend Montag to his will, or, failing that, to break him. The film’s cast also includes Sofia Boutella (The Mummy) as Clarisse, an informant who finds herself caught between Montag and Beatty’s conflicting interests, and Lilly Singh (Bad Moms) as a tabloid reporter named Raven who works with the fire department to spread ministry propaganda by broadcasting their book-burning raids to adoring fans. In our era of fake news and alternate facts, Bradbury’s story figures to take on a newly horrifying layer of significance. We can only hope HBO’s Fahrenheit 451 delivers on all the promise of its cast, crew and source material. Watch today’s new trailer for the film below and revisit a previous teaser here. Fahrenheit 451 debuts exclusively on HBO this May.